Editing is extremely powerful. It can take something as dull as dancing and make it seem really fun. Of course, there are movies like "Lagaan" that make me think, 'Now that's a style of dance I could get into,' but those movies are very few and far between. If you haven't seen "Lagaan" it is well worth the four hours to watch. My history with dancing is quickly thus: I went to a '50s "swing" party back in the day and had three cute girls tell me they could teach me how to dance. Two minutes later they all said, "Luke, go practice... by yourself... over there." Then, in the musical "Hello, Dolly!" I was dropped by my dance partner with whom I had practiced for two months for another guy the night before the show. But there is a scene in the really good movie "Take the Lead" which can really turn you on to dancing. Katya Virchilas in "Take the Lead"
Unfortunately, this scene is only impacting in full motion. Fortunately, someone has been good enough to stick in on YouTube so you can get the full effect. ...and then you remember the last time you danced with a pretty girl who was good at it: How you stepped on her toes--not just figuratively--how nervous you were, how light she felt, and how her scent made you a little dizzy. It was fun to hold her in your arms, but the dancing part? Forget it. Good filmmaking, and editing in particular in this case, can make you feel like doing something stupid, or at least leave you wishing you could. I really wanted to go jump off some buildings when "Spider-Man" ended. I recently realized that one of our props for MathTacular3 had a typo on it. The sticker we used said "Erastothenes" rather than "Eratosthenes". The problem is that this was on a close up in the video and not just a title card. So, I needed to fix it in post. The first step was to "photoshop" (I used GIMP) the correct spelling onto the image. Easy enough. I tried to match the motion of the actor's hand with my replacement text, but I couldn't get it to truly lock on (this is difficult to do, and this kind of motion mapping can be seen breaking down in the opening title of shows like "Heroes"). So, then I tried just taking a freeze frame and playing that instead. It looked bad. The popularity of zooming in and out of photos--or having them pan side to side--in video is due to people wanting motion pictures to have motion... even on their pictures. Trust me: You don't need motion on all pictures, but if something is obviously supposed to be video and is static, it looks bad. So I needed motion from my static image. I first tried enlarging the image and just moved the freeze frame around the screen a little, but that looked completely wrong. The image was still static, but it seemed like the camera was bouncing around. Obviously the wrong effect. So I needed to cut out the foreground and rebuild the background so I could move one without the other. This kind of trick has been used for years in films as different as "North By Northwest" and "Minority Report". First, cutting out the hand was easy (if you'd like a tutorial on how to do that, please ask). But then I needed the background. This I completely rebuilt from another image I had of the chart and then a couple of gradients for the background. In the end, I could move the "hand" layer over the background, giving my video motion. The final result is pretty good. There are certainly problems with it, and if that doesn't work we may need to reshoot a close up. And that's the first lesson: Just because it is possible to fix things in post does not mean that you should, and you certainly should not count on your ability to do so. However, the second lesson is this: Even with very simple (even free) tools, you can pull of special effects that an audience will buy. You just need to be willing to think outside the box, and have some idea of what it is you need to do. When people show up for your casting call, it is best to have a small table set up outside the room where you are holding your auditions. Have someone (preferably a nice girl you know) at the table to make sure the person fills out a form with their name, contact information, and a little about themselves. Make sure you have "sides" or the script available for the person to look over, and also offer them some snacks and at least a cup of water. Also, have some signs posted to your casting call if it's not immediately obvious where they are supposed to go. Have some chairs setup and a camera facing an open area where they can stand and act. I find it a good idea to see if they have any questions about the story or the characters. Then have them run the scene. You read the other parts. Don't worry about acting well, you need to see how well they act on their own. After each attempt give them direction and correction for what you'd like to see them try. Pay attention to how well they adjust to your requests and directing. Make sure your video camera is running when they are acting so you can review the footage again later if you need help in deciding who should get what parts. It has only been in the recent past that I have begun to be able to see the difference between good and bad acting. That being the case, I don't think I'm at a point where I can give tips on what makes actors good or bad, believable or forced. The best advice I can give at this point in time would be to watch a good film with fantastic actors in it before you cast. Good acting is believable. Great acting is subtle. While theater trained actors will often be "over the top" to reach the person in the back of the auditorium with their performance, movies get right up close to the person. It's the eye flicks and slight lip spasms that distinguish fantastic acting from the rest of the world in film. But in the end, as with everything here at Production-Now.com: Use what you have. If you wait for Guy Pearce, Denzel Washington, or Grace Kelly to show up, you'll never shoot your movie. Work with what you have and you may be surprised with what you can do. We're in pre-production for another short. I wrote it back in college and have since cleaned it up and made it snappier, funnier, and, hopefully, better. But even with a script, equipment, locations and talented people to help me out, I still need actors. But how do you get actors? The most obvious way is to talk to people you know and bring them into your projects as your characters. This works really well for a while, but eventually you'll have a project where your sister or brother-in-law just won't quite work anymore. Which means you need to go the next step and have a casting call. This is where you procure a location where you can have a room to yourself where you can set up a video camera, have people come over, and have them try out for a part in your movie. I've found that my house and my church are two pretty good locations, depending on how busy the church is and how clean my house is. The crazy thing is that people actually come to these things. Not many, but a few. So, pick a date when you think people may be available (10am on a Tuesday probably isn't going to work, unless you're looking for retired folks). Then find a place that will let you use a room. Then start inviting people. Now there are publications for actors, especially in California, where you can advertise. This may or may not bring in people. Your best bet is not posting fliers, at least in my experience. The last big shoot we did saw us plastering posters everywhere (coffee shops, schools, recreation centers, churches, etc) and we didn't get a single call for them. Instead, call up the people you know, or talk to people you know about people they know. Eventually you'll get a handful of people to choose from. I'll post about the process of hosting a casting call tomorrow. I was at a gas station this morning filling up my tank when I noticed an interesting arrangement. A small blonde haired high school girl was drying a large muddy Jeep. The girl was dressed in flip flops, high school shirt, and a pooky shell necklace. The Jeep was a very rugged rock crawler with huge wheels. Both very full of character alone and when paired together created a completely different character. Had this pairing been in a movie it would have been the work of the Production Designer illustrating the mind of the Director. 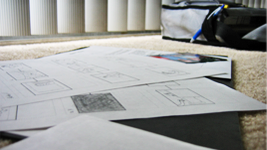 The Production Designer is in charge of all set design, costumes, and props. Their job is very important. A professor at my college said in one of my recent classes "If you were to take away all the work of the Production Designer you would be left with your actor standing in front of a black sheet”. The Production Designer takes the script and creates the world that it calls for. The Production Designer works closely with both the Director and the Director of Photography to make sure he accomplishes this task accurately to the Director's vision and the films overall feel. Upon our location scout a few weeks back, for an upcoming short I will be working on, we found a big house to shoot a few of our scenes in. We needed a bigger house because we had hoped to use it for two different houses called for in the script. For the first few scenes the house is that of a single middle aged business man who enjoys having friends over but, is rather depressed. For the second it was the house of a Soccer Mom who owns many big Newfoundland dogs. The house in its current state would not of worked for either scene because it had white walls, white furniture, white decorations, and white pictures. The Production Designer decided that he was going to bring in burnt autumn colors, oranges, reds, and browns for the scenes with the man and make the rooms messy. For the soccer Mom we are using the Kitchen which the Production Designer decided he wanted to be blue in color with various cookbooks and other Motherly props which would all look very tidy. Volkswagon Beetle to fit with her character more. But, perhaps she had a adventurous side. Either way a little bit of Production Design goes a long way. My sister sent me a link to the following "list". The author lays out a wish list of things she wishes people would stop doing because she homeschools. [As an aside: "Homeschool" is still not considered a word by my word processors... how lame is that? It's pretty lame.] The basic thrust of this darkly humorous rant is that it is very possible to get a good education at home. And this applies to media production as well. In fact, I've had several mentees ask if they should attend film school. I always tell them yes, but only because it will force them to try their hand at different aspects of filmmaking. It will require them to actually produce stuff. But the learning isn't done in the classroom. Of my four years and one hundred grand of film school, I still quote a handful of lessons. You learn far more from doing it. Every film I shoot teaches me buckets more than what I learned sitting behind my desk typing notes. So, if you don't have $100K to blow on going to California to spend four years learning that your next step will be to make copies of scripts and learn how to brew coffee for high-strung, ADD people who don't care about you at all, don't fret. But you do need to get busy. I'm not bashing film school. I loved my years at the University, and what I did there prepared me and allowed me to get to where I am today. But it's what I did, not where I went or what classes I sat through. Which is the entire point of this site: Production... Now. If you're interested in media production: Start today. If you don't know where to start, let us know. We're here to help. Not sure where to go for help? Want a little "one on one" time with someone? We've got the solution: Post your question, comment, or concern on the Forums, and we'll get back to you. Your learning from home could start right now. Welcome to the world of homeschooling. Well, yes, it's true: I could. Then again, I might not. I certainly have yet to truly "prosper", but I have been able to keep paying the bills this way. But there's another aspect of "prosperity" that often feels absent from a life of entertainment or media production: Connection, friends... love. There is a tendency to feel used, sure, but loneliness is worse. After the mad scramble of production, you may find yourself feeling a let down, alone, and worthless. That is why producing things with friends is so great: You're around people you like, and when the project is over you're still around them. But as projects get bigger and move beyond the scope of home movies (no matter how good), the gap begins to form. More resources demand more time, and after throwing yourself wholeheartedly into a project for a week, month, year or more, coming back to "reality" can be hard. I talked with a guy last night who was completely bummed out because he felt alone, like he had no friends, and that life was pointless. Just three weeks ago his schedule was packed with shoots every couple of nights for weeks on end. People begged him to be part of their projects. ...and today he's alone. How do you counter-act these feelings? Part of it is just natural. We feel down after we've been on a high, be it activity, drugs, or sugar. "What goes up..." and all that. But it's also important to take action. If you feel alone, go spend time hanging out with people you know. You don't have to do something big or important, but you do need to get out of bed and go find people to be around. This will, hopefully, give you a better perspective on life. Media production is fun and important, but people are more important. I just submitted a proposal to a company that they hire me for a job that I suggested they create for me. I had heard of people writing their own job descriptions, but I honestly never really thought of myself as being one of those people. Granted, writing up something and having the "powers that be" accept it are two very different things. But the exercise is important: Stepping up to something, giving a little push and seeing if the ball will roll. This is a huge part of media production. We all start with almost nothing (maybe a script and a few pieces of equipment at most) and then we try to get a bunch of people to join up. At any point in the process the whole thing could tank if just one or two key people said, "Um, no thanks. Not interested." That happened the day before shooting was supposed to begin on one of our larger projects back in the day. We'd spent months on pre-production and I got to call the actors who were already driving over for the shoot and tell them they could go back home. That was not one of the more enjoyable days of filmmaking. It's also important to stand out, to be good at what you do. I don't mean that you need to be radically different from everyone else, or spend more money, or tackle different subjects, you just need to be good. A comment on ERL pointed out that Marvel has made the two top grossing, non-sequel films ever ...that's not only impressive--shall we say, "Marvelous"... I know, I know--it makes them stand out. From my study of psychology and for various reasons, I am convinced that, as humorous as Gary Larson is, the brain can not fill up. But your hard drive can. When your hard drive fills up, strange things begin to happen... or, to be more accurate, normal things stop happening. For instance: I was recently capturing footage onto a drive that has been working just fine, when all of a sudden the computer would start "dropping frames" whenever I was dumping footage. It would seem that a "dropped frame" would happen when the computer wasn't working fast enough; the computer just couldn't keep up for whatever reason. But once I cleared out 50 more gigs on the drive, it's been capturing just fine ever since. Why is this? Well, when you've got space, stuff works better. And that's true of your brain too. Granted, not quite in the same way. I've got a lot on my mind today; some really heavy stuff. And so the prospect of writing a blog entry was more than a little daunting. With all this other stuff going on, I was having trouble focusing. So, I needed to delete some stuff. Not like in "Pi"--which, if you don't know what I'm talking about, that's perfectly okay--but in a "clear the mind" kind of way. Almost like a shift is focus, where you force (or allow) your brain to get on a different subject so you can move forward. Go someplace different, walk around, or maybe even just turn your chair around for a while. This isn't writer's block, or anything like that. This is just too much information stuffed into your brain. You need a chance to purge it. Just like real life, in movies, things also must happen in threes. If you want your audience to remember anything, it has to happen at least three times. The quote is repeated three times. Hilarious. And that's the idea we worked with today. His short has two major themes, but in his latest draft one of those themes had all but vanished. So, we went through the script and found seven more places to repeat his theme. The story makes much more sense now, and it also is much more humorous. As you work on your stories, make sure your themes are present, but also be sure to keep the number to only one or two. Too many ideas and your film falls apart. My mission today was to record a group of 15 people talking. I looked into the option of renting 15 lapel microphones, and it would only have been about $300. Not bad, but then there's the added hassle of hooking everyone up, making sure they are comfortable, and doing your best not to have someone walk off some place where audio should not go with one still attached (e.g. el bano). After getting a clearer picture of what was needed, I found out we merely needed the audio for future reference in case the notes taken at the meeting were not enough. So the voices merely needed to be audible and intelligible. I sat down with the girl who would be running the meeting and discussed the seating arrangement, what kinds of things would be happening in the room, what would be on the table (no candies with wrappers or hard candies in glass bowls, please), and worked out the setup. The tables would be setup in a U shape so everyone would be able to see everyone else. So, I put three omni-directional lapels on the three tables and set up a shotgun mic by my camera so I could point it at the person speaking. Was the audio perfect? By no means. I won't be winning any Oscars for sound design on this one, but you could hear everyone and understand what they were saying. Besides, the audio wasn't perfect anyway because we had a baby that tended to scream and some people tapping the table legs. But we didn't have any click-able pens. So, as you prepare for a recording session, take a minute and think about the things that could make sound, the types of noises you will likely encounter, and do what you can do stop them. Our ears are very good at tuning out sounds we don't want to hear. As a media producer, you often need to purposely turn off that ability and listen for the sounds the microphone will pick up that no one else will notice. In a room full of talking women, I often hear the clock on the wall ticking. Surprising to the uninitiated. I would have moved the clock if we hadn't needed it to keep us on schedule. Bear with me a second: Scott Simmons blogged about a video that Shane Ross Twittered about (and eventually posted about himself). The video, as of my checking when I started writing this post, has over 327,000 views. So it fits in with yesterday's theme. It reminded me of all the talk about viral marketing that I hear about these days. The goal of viral marketing is to make your ads in such a way that people don’t feel like they are watching advertising. The only clear "advertising" bit would be the very end telling you purchase the song. Also, demonstrating all the stuff you can do on a Mac felt a little "ad-ish" as well. But what gets this thing passed around, and therefore people clicking on it and watching it, is the amazing creativity. That's what made the Honda Commercial so special too. And so my guess is that you can make an ad as "ad-y" as you like, it just has to be something people want to watch. Do that, and people will pass it around like a hot potato. I was talking with another filmmaker yesterday about an upcoming project we're working on. He mentioned a video that someone had sent him that had something like 20,000 hits already, but, he admitted, it wasn't anything special and wasn't even that good. So why did it have 20,000 views and our latest project had less than 600? What causes things to get passed around? What makes things popular? That is the subject of books like "The Tipping Point", and worthy of much study. But I raised a different question: Is that really what we, as media producers, want? For example: Numa Numa has 13 million views in that YouTube rendition alone. 13 million. Dag. But what else has Gary done, except get on a Wikipedia page? Sure, millions of people have seen his video, but his other attempts to repeat this flopped. Now, sure, it's cool to get millions of hits, and I'd welcome it. But if I had to choose between 13 million hits on one of my videos, or a consistently strong following from the stuff I produce (think Shyamalan or Spielberg), then I'd be much happier with hundreds of thousands of followers over a few million hits. The problem is I currently get, at most, 10 hits a day... with maybe that many followers. It's a start, but I'd like to help more people. And, hopefully, if you produce good content "hits" will convert to "followers". At least, that's my current plan. Turns out that, surprisingly, the USPS is... with enough money and if the files are large enough. So, after setting up some space online to transfer 12 gigs of information, I started the download. Only 36 hours to go. Instead, the artist I'm working with dropped her tape in the mail yesterday evening, shelled out $16.25, and I had it in my hands when I got home from work at noon. Now I'm dumping the footage and we're moving forward with this art project. Hopefully. ...having some issues with capture. I'm working with an artist at a university in California to help her complete an artsy video project she is working on. I hope it turns out because I'm doing the editing. But since she's in California and I'm here in Colorado, we have to work out the technical stuff long distance. It's hard to walk people through steps when you have to rely on them to tell you what's going wrong. Granted, if everything is working it's cake. But the moment someone says, "Wait... what?" you know you have a problem. So, I needed to walk her through capturing footage in 10 minute increments. I know this process very well, and while it took me just a couple of minutes before the system was purring away on my machine, it took me almost 30 minutes to get her tape dumping. That was surprising to me. It goes to show two things: 1. Sitting in front of a computer and being able to interact instantly with the person and their machine makes for faster help. 2. Learning how to do something and not having to look stuff up speeds up the process. Familiarity with a system allows you to fly. However, every time you encounter new software the steep learning curve almost kills you. "I could do this so much faster on my old machine!" I say over and over again. So, troubleshooting and learning software requires patience. A lot of patience. And a lot of time. May you find the patience you need for your projects today. This post isn't about media. Well, not directly. Instead of working on media stuff this afternoon, my wife asked me to make her a tumbling composter. So, armed with a few tools, a 55-gallon barrel (which was $50, but the checkout girl was cute, so... you win some, you lose some), some parts we picked up at Lowes-Depot, and various parts I had laying around my garage (I had a 72" by 1 3/8" steel pole... who knew? ), I threw together a pretty sweet composter. Media production is mostly about using the tools you have to accomplish what you want. This means you need to get a "Do It Yourself" mentality (what the web people call DIY). I know it sounds scary to step off the cliff into the unknown, but that's what filmmaking--and any other media production--is. But you don't have to do it alone. Always get help, second opinions, and other's input. I had three other people hovering around as we put the thing together. It wasn't just me, as much as I would like to take all the credit. So, Tip 1: Do it yourself. Get your hands dirty. But, Tip2: Get help. Do it yourself, sure, but don't do it alone. That is a good balance to learn how to strike. Every once in a while I have to put myself in front of the camera and shoot myself. This is difficult to do. Not from a framing standpoint; that's easy since my camera lets me flip the screen around. The audio's pretty simple too. Starting the recording is not hard either. It's acting that's difficult. The first major problem is that my mind is typically on the things I'm thinking about behind the camera: How's the framing? Where am I going to cut? Was that pause too long? Did I miss a word? Is the microphone picking up that person over there? All those questions make it really hard to keep the lines you have memorized in mind. And I don't have anyone telling me that I'm doing okay, to keep trying, that it's only tape. I am pegged with all the frustrations of filming. The second issue is that I can't really find other angles to cut to. When I shoot an interview, I make certain I get it from a few different angles so I can cut if they ever mess up. I don't have the option of simply changing the angle if I mess up. Today proved the third issue that can arise: You don't want to disturb others if there is anyone around. It's one thing to get over yourself and talk into a camera by yourself... it's something completely different to just start preforming with someone across the cube wall from you. It's something even more if you keep messing up. So, yes, the joys of capturing yourself on tape. The lesson that I need to still learn is to relax, it's only a movie, a video clip. The only other big advantage you can give yourself is to get over yourself, throw your pride to the wind and just shoot the thing. I write a lot about filmmaking because that is my focus, but Production-Now.com is about media production, so today I'm writing about web development. It is important whenever you are working on a website to test it on various browsers and on various machines. For instance, the website may look fine in, say, IE, Firefox and Safari on a PC, but not good on Firefox on a Mac, as was the case of a website I was testing today. It is fairly common for websites to display differently on different web browsers--such as Firefox and Internet Explorer, especially because IE doesn't keep itself compliant with web standards--but to see such a vast difference in the same browser on different platforms was surprising. I'm pretty sure the web guy over there has fixed the problem, but it was a good reminder to test your site on other machines and browsers.